Nothing says summer like a slice of juicy pie and this fresh apricot pie with lots of sweet/tart apricots piled into a buttery crust doesn't disappoint! Start by making the crust. Pulse the flour and salt a few times in a food processor to combine. You can also do this by hand with a whisk. Add the cold chunks of butter and shortening to the bowl and pulse about 20 times until the mixture is grainy. Add the ice water, a little at a time, while continuing to pulse, until the dough just comes together when you pinch it between your fingers. Stop the machine to check it. NOTE: you will not need all of the water. Turn the dough out onto a floured surface and bring it together into a ball. Add a little more flour if the dough is too wet. Cut the ball in half, form two disks, and wrap each one in plastic. Refrigerate the dough for 2 hours (or overnight) before rolling it out. Toss the apricot slices with the sugar, cornstarch and lemon juice. Roll out one of the disks for the bottom crust and fit into your pie plate. 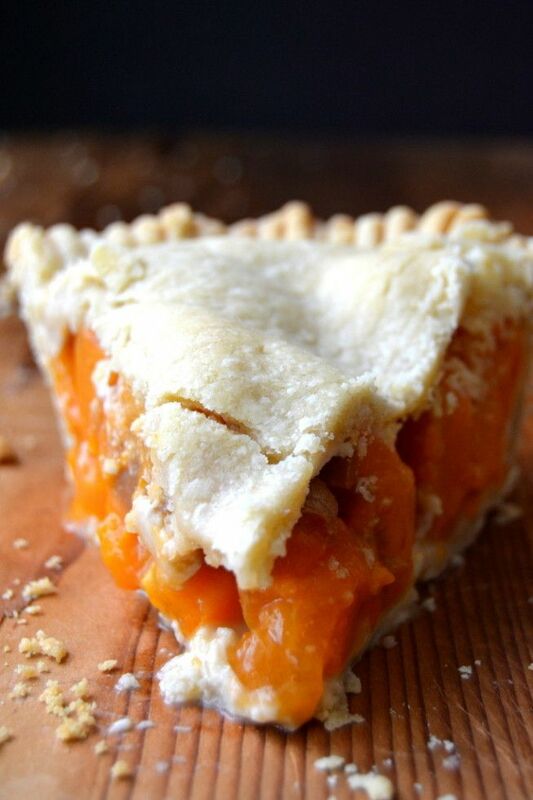 Fill the crust with the apricots. Roll out the other disk to make the top crust and cover the fruit. Seal the edges with the back of a fork. Cut small slits in the center to allow the steam to escape during baking. Bake for about 45 minutes, or until the crust is just beginning to turn golden around the edges and the juices a bubbling.